Since then my involvement with letterpress printing has deepened and I have acquired a substantial collection of lead and wooden types, printing machines and other paraphernalia – much of which I have rescued and restored to working order. I have a 1888 Double Crown Wharfedale cylinder press running that I acquired and had it moved from Wales and restored it at my workshop in Coggeshall, Essex. I have also completed an extensive restoration of an 1857 Columbian Press, for which I had many parts repaired, the most challenging was to have one of the main castings re-made as the press had been badly damaged during its’ former life within the print room of an art school. After having spent many years designing and printing letterpress work for friends, family and fellow printmakers, I decided to introduce my designs to a wider audience and, together with my wife Cecilia, started Typoretum. 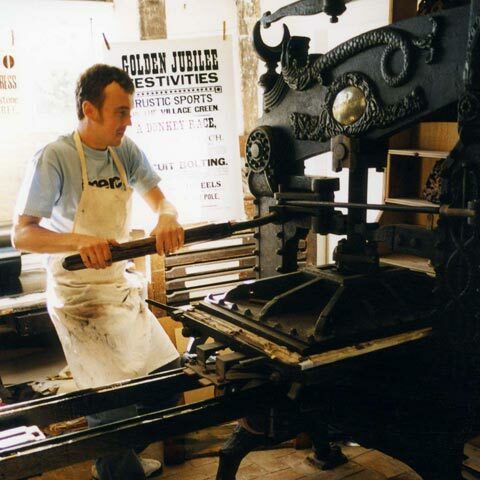 Today it is a busy, family run, contemporary letterpress design & printing studio offering a wide variety of services. We run short courses and internship opportunities to ensure that the craft is kept alive and continues to be taught to a new generation of letterpress printers, designers and enthusiasts.